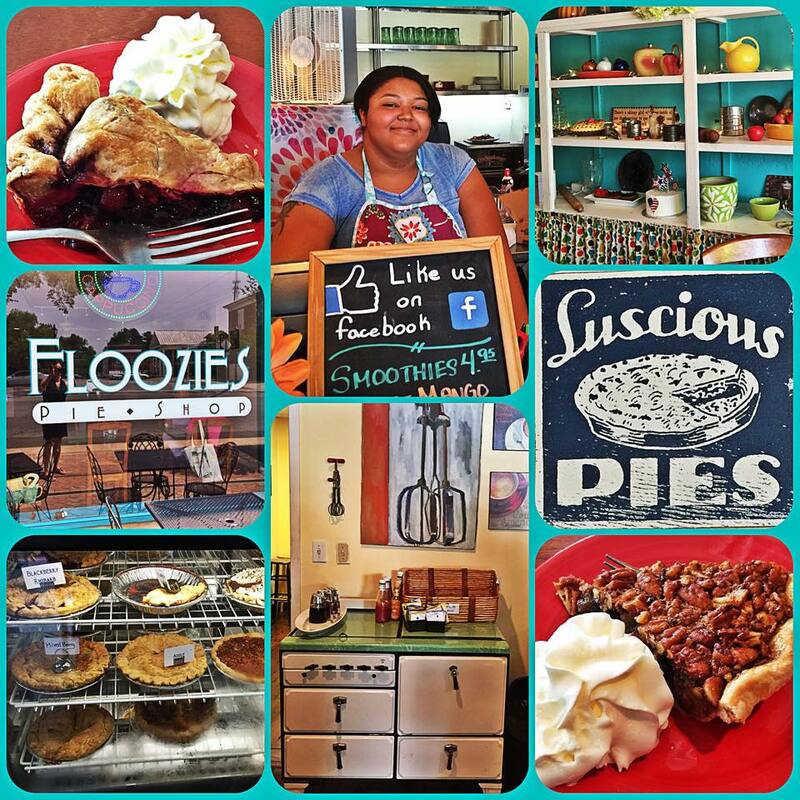 If ever there was destination pie, Floozie’s Pie Shop in Louisa is it. This cute little shop could be plucked straight from Mayberry or Stars Hollow with its kitschy ceramic decor, funky furnishings, bright walls, and plucky café personality. We were on our way to Fredericksburg from Staunton, slowly passing through Charlottesville and Keswick on the way, and so took the Louisa Road as an alternative backroad that we hadn’t driven in a long while. So when we got to the mostly sleepy county seat at Louisa, we decided to walk around, check out the historic markers, see the old jail, and check out the shops. That’s where we also took in Hey Gorgeous Boutique, a ladies consignment shop that I also reviewed. Photos and collage by Girl Goes Virginia. We don’t usually eat dessert in the middle of the morning but Floozie’s look and feel was too irresistible to pass up so we splurged. I had the Chocolate Bourban Pecan Pie and hubby had the Mixed Berry Pie. I also went for a nice Southern Iced Tea. Clearly this was going to mean a sugar high, a rarity for me, but hey, this was a getaway. Both pieces were fabulous and hard to choose; we had to pass on apple, chocolate cream, berry rhubarb, and heaven only knows what else was filling that pie case with temptations untold. Apparently Floozie’s also serves breakfast and lunch and if the plates coming out are a good signal, the burgers looked awesome. I checked out the breakfast menu — always my fave — and it looked like a standard selection of simple down home goodies. If I lived nearer, I’d try ’em one morning or for lunch, but I’d encourage them to add collards to the sides, and maybe up the Virginia and Southern menu vibe a bit — no need to be standard (Greek Salad, Club Sandwich) when you can be a local standout (Chicken & Waffles, Peanut Soup, Brunswick Stew?). But I can say the pie is worth the drive, especially if you scare up some other things to do in the area — Civil War attractions, BBQ in Gordonsville, going to or from C-Ville. I mean a totally homey pie shop in the middle of a small town? It’s like Twin Peaks without the creepiness but with whipped cream on top!